"Despair represents someone's sorrow or anger. Ray represents happiness and hopefulness. 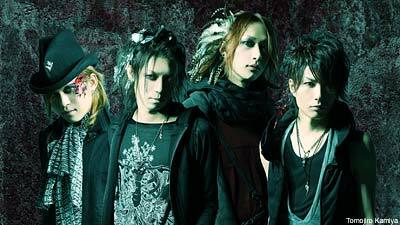 We wanted to express two different emotions in our band name," explains D'espairsRay guitarist Karyu. Meet D'espairsRay. The visual kei band from Japan is an exercise in opposites. Despair vs. hope. Androgynous vs. masculine. Modern vs. retro. D'espairsRay draw on many influences to create their uniquely modern metal sound that's simultaneously heavy and glam. Visual kei has a lot in common with Sunset Strip glam, since both genres have a lot to do with stage presence and looks. Costumes and makeup are common here, but D'espairsRay are quick to caution that they don't want their appearance to overshadow their music. "Musically speaking, visual kei can do anything," explains bassist Zero. "[A] metal band for example, can only perform metal-like songs. One thing we like about visual kei is that we can do anything we want." D'espairsRay recently signed with Universal and just released 'Redeemer.' By all accounts, this is the record that should make the band widely known in America. The 2008 edition of the Taste of Chaos tour featured D'espairsRay, and the band hopes to play the U.S. again soon. While they refuse to name specific bands they'd like to tour with in America, members of D'espairsRay did recall some interesting onstage moments from tours past. "Someone tied my shoelaces together during a performance ... it was very disturbing and hard to perform," acknowledges Zero.